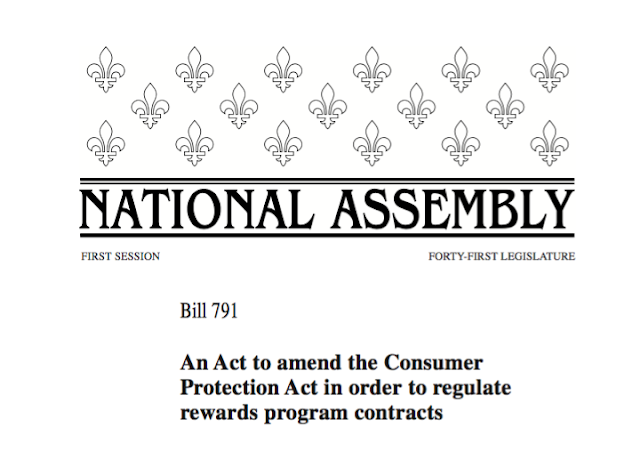 Rewards Canada: What is going to happen to loyalty rewards in Canada if Quebec passes Bill 791 and programs have to retain point/mile value? 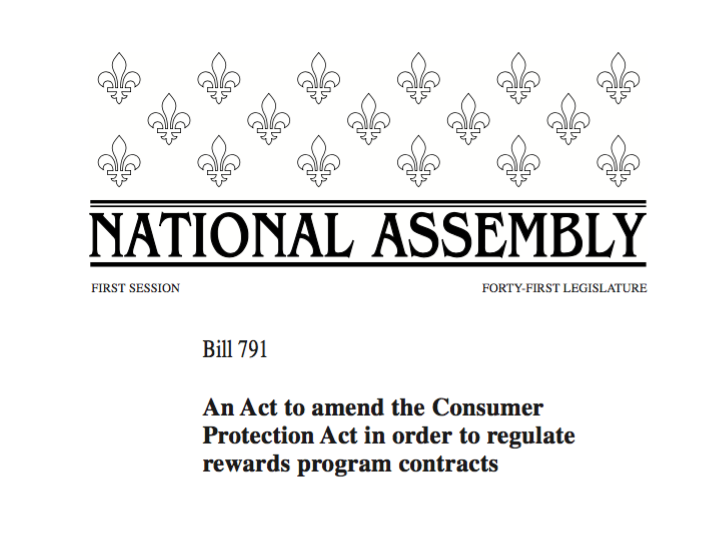 What is going to happen to loyalty rewards in Canada if Quebec passes Bill 791 and programs have to retain point/mile value? The coming weeks could see drastic changes in the loyalty landscape in Canada. Earlier this year new legislation was proposed in Quebec that followed in the foot steps of Ontario. The Ontario legislation covered the expiry of loyalty points and was passed so that points and miles earned from programs would not expire based on time but could due to inactivity. Quebec is now wanting to do the same but are going a step further, they want to make it illegal for programs to change redemption rates (ie mile/point value) from what you get when you sign up. “187.6. Before entering into a rewards program contract, the merchant must inform the consumer of the conditions applicable to obtaining and using rewards points. “187.7. Subject to any applicable regulations, any stipulation of or amendment to the contract providing for an expiry date on the rewards points obtained by the consumer is prohibited. Line 187.7 is essentially the same as Ontario's bill however line 187.8 goes that step further. It does not allow programs to change the value of reward points accumulated. This means programs cannot change redemption rates as that effectively changes the value of the rewards points accumulated. We saw last year the conclusion of a class action lawsuit against TD in Quebec when they changed their reward redemption rates in the TD Travel Reward program. TD settled and let Quebecois keep the old better redemption rates until August 31, 2017 whereas the rest of Canada had to book at higher rates. Then there was the whole AIR MILES debacle in 2016 and the risk of rates going higher with them since they aren't expiring miles and you can see why Quebec has added this line into the legislation. This is why the mbna Alaska Airlines MasterCard will no longer be available in Quebec as we know that Alaska Airlines will want to change redemption rates in the future. But what does this hold for existing members of Mileage Plan and all other programs? What is Aeroplan going to do? Quebec is huge for them - they could get rid of Classic Flight rewards and go strictly market fare but that would kill their membership base in the province. Then there is AIR MILES, Shoppers Optimum and scores of other programs. How are programs going to deal with not being able to change the value of the points and miles earned by their consumers in Quebec? This is huge. It looks great for the consumer in the way that you won't have to worry about your points devaluing through redemption but the programs need to stay alive and changes every few years were the norm. So we'll pay for it somehow and the logical option is changing the earn rate. Will we see lower earn rates on credit card spend? Will we see AIR MILES earning go from 1 per $20 spent at merchants to 1 per $25? By changing earn rates you aren't changing the value of your point or mile which means if and when this bill passes don't be surprised if we see earn rates drop over time. Remember this is just Quebec at this time proposing this law however it is setting precedent for other provinces. There is nothing stopping Ontario from amending theirs to include point value retention as well and after having two provinces with reward program rules in place it won't be long before we see other provinces follow suit.